Bangkok, November 14, 2016 -- TRA UAE's Director General, H.E. 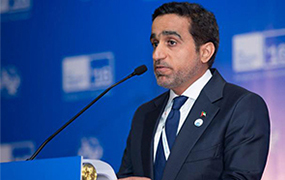 Hamad Obaid Al Mansouri, in his speech during the opening ceremony of the ITU Telecom World 2016 in Bangkok, Thailand, emphasized on the need to understand the value of collaboration as a way to assess the degree of true innovation required within the ICT industry. Mr. Mansouri drew attention to aligning international standards and policies to effectively respond to fast emerging technologies and their impact on humanity. The TRA also recognized the ITU's global role as an organization that has provided direction and experience to regulatory authorities all around the world. Mr. Mansouri mentioned that while challenges will continue to exist, horizons too will be open wide for great achievements if nations and concerned stakeholders joined hands toward mutual causes. Mr. Mansouri stated that "The spirit of [the UAE's] story is cooperation and unity. This was the culture and directives of our founding fathers who brought together seven small and conflicting emirates into one progressive state, now called the United Arab Emirates. We believe that the ITU also creates the model environment where nations can work together to achieve success for all." The TRA DG's message shed light on the UAE's contributions toward realizing the value of international cooperation for the benefit of the human society. The message reiterated the UAE's commitment to the United Nations' 17 Sustainable Development Goals of 2030, which have been integrated into the UAE's national strategies, put in place to improve education, health, society, economy, science, environment, and industry. As a part of his government's vision to prepare the future generations for the challenges ahead, Mr. Mansouri mentioned that the UAE has "launched the Mohammed bin Rashid Smart Learning Program, a 1 billion dirham program that is a part of Vision 2021 and will be introduced in four stages over five years, fully supported by the telecom sector and financed by our national ICT Fund." Addressing a large audience of government and business leaders, the TRA's DG, on behalf of the UAE government, also expressed deep condolences and sympathy to the people of Thailand on the demise of their beloved monarch, King Bhumibol Adulyadej, who passed away on October 13, 2016, and was the world's longest serving constitutional monarch. The ITU Telecom World 2016 is being held from November 14 to November 17 and is hosted by the government of the Kingdom of Thailand in Bangkok, one of Asia's most cosmopolitan cities. As an ITU-D sector member, SAMENA Council is also participating in Telecom World, during which it has chaired the 7th Private Sector Chief Regulatory Officers' (CRO7) Meeting, a private-sector representative forum composed of telecoms technology companies and other stakeholders from around the world.